Thanks to my west coast friend and musical colleague, Kalle Nemvalts, for sending me a photo of a 16 year old Kenny Garrett performing with us in the II-V-I Orchestra at the Earle in Ann Arbor, MI back in the 1980s. Kenny would go on to become one of the greats on alto sax. This weekend I'm headed to NY to hear him at the BlueNote with Chick Corea. I remember when he was trying to choose between going to college and hitting the road with the Duke Ellington orchestra. 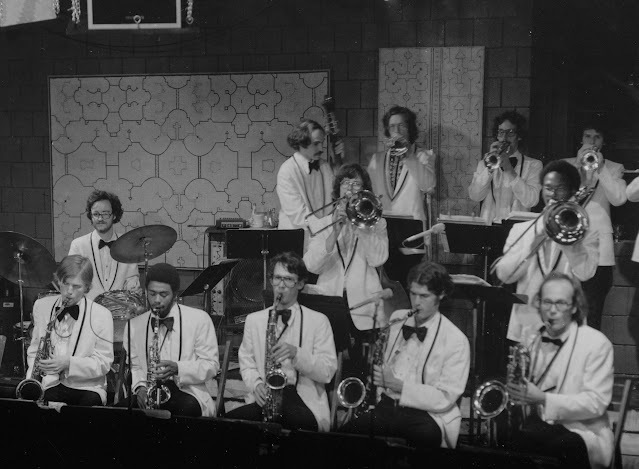 Big bands had long served as jazz's version of a university. Kenny chose that route, which led ultimately to a long association with Miles Davis, vaulting him into the highest ranks of the jazz world. Back when he was in high school in Detroit, our paths would cross in David Swain's big band, playing nightclubs and society gigs in Ann Arbor and the Detroit area. He had a rich, round tone on the alto, but what most set him apart from everyone else was the thought, or pre-thought, that went into his improvisation. There was a calm and focus to his playing, a poise that is visible in the photo, communicated through his tone and the notes he chose. I remember him sitting next to me in the sax section, and when he stood up to take a solo, I could see his next phrase forming in his mind. When a saxophonist improvises, there's a tendency to fill the empty space with sound, to pour notes into the void--that chorus or two allotted to you--and hope it all makes sense. Oftentimes what comes out is a repertoire of stock phrases that through practice have become engrained in mind and muscle memory. The avalanche of notes may convey some overall feeling and energy, may impress in some way, but their origin is more in habit than a welling up from heart and soul. Kenny wouldn't give in to that temptation to spill notes for notes' sake. If he wasn't sure what to play next, he'd pause a moment, like a speaker who has gone off script and chosen to speak directly to the audience from the heart. Sitting to Kenny's right in the photo, in front of the drums, is Pete Klaver, a formidable and facile tenor sax player, who graduated from Ann Arbor's Community High, an alternative high school with a great jazz program that was also nurturing the New York-bound Mann brothers, Ned and David. One night, at a gig in Ypsilanti, MI, just down the street from where Dominoes Pizza was born, we were all warming up back stage, and Pete was playing John Coltrane's solo on Giant Steps, which he'd memorized verbatim. Kenny turned to me and quietly said that he liked to make up his own lines to the Giant Steps harmonies, and proceeded to play the most beautiful lines I'd ever heard, like water from a spring. That's when I became aware of the depth of Kenny Garrett's magic. Kalle's in the back row, on trumpet, standing next to the bass player; and leader David Swain is in the lower right on baritone sax, with me on tenor to his right. At this link, you can learn that Kenny Garrett dedicated a song on a recent album to David, whose II-V-I Orchestra was a university of sorts, bringing so many of us together to play the original arrangements of Tadd Dameron, Frank Foster, Dizzy Gillespie and other legends. That exposure surely fed my own composing and arranging years later. 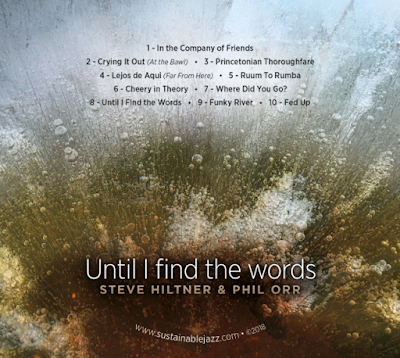 Phil Orr, who plays keyboards with the Sustainable Jazz Ensemble, is a man of many collaborations. In addition to teaching at Rider University, he leads his own trio, and is accompanist for the founder of Grounds for Sculpture, J. Seward Johnson, during his Thursday singalongs--all fun and no cover. Check out upcoming performances in Princeton, Rats Restaurant Gazebo and elsewhere at Phil's website under the "news" tab. Below, Phil and friend offer a whimsical performance of one of Wardell Gray's brilliant saxophone solos, later immortalized in lyrics. Gray's original recording can be found here. Part of my training on saxophone involved transcribing solos by Wardell Gray and other greats, to develop my ear and gain some sense of how they could navigate through the harmonic changes with such ease.